Prayer meetings. Prayer is part of the Christian life and it also forms part of the Church's life. We pray about many issues affecting our city, our lives, our missionaries and our Church, amongst many other things. See the diary page for details of meetings. Bible studies. We meet together to read the Bible, pray and talk. There are a number of groups that meet on different days and at different times during the week. Contact us for more details. Babies and toddler sessions are available for those looking after children. a once-a-month event for anyone in the community, with a different theme each month and a meal included. More details on the right of this page. Just come along to any of these events or send us an email for more information. 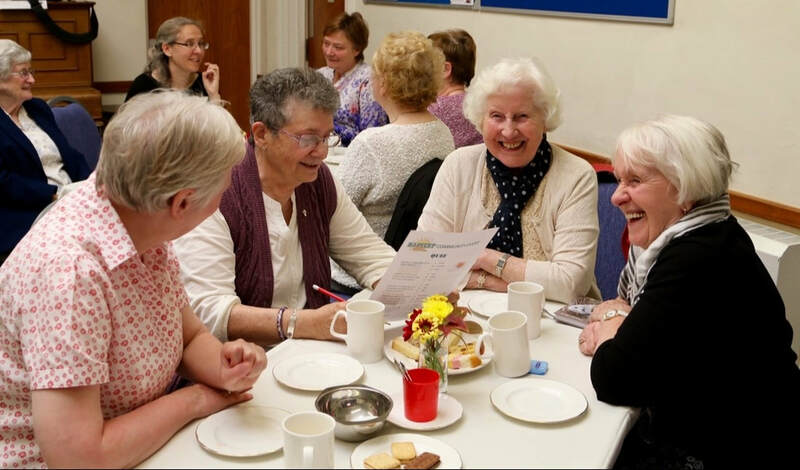 Our monthly Community Event is a social occasion for everyone in our local neighbourhood, although many of those who come are senior citizens. A short talk from the Bible. The morning events are followed by a light lunch at about 12:15. The menu varies from month to month, and typical dishes include homemade soup, baked potatoes with fillings, quiche and salad, and sausages or fish and chips. Involvement is the key to the morning so we invite you to come and share your experiences, skills and ideas in a friendly relaxed atmosphere and enjoy the warmth of Christian fellowship.